The instrument has an azimuth circle and a geometrical square, over which an alidade can rotate, for horizontal measurement. The alidade carries two sights (only one of which survives) and is surmounted by an altitude semicircle and shadow square with sights for vertical observations. The instrument is completed by a plummet and compass bowl. The azimuth circle is 200 mm in diameter and has a scale of degrees from 0 to 360, divided to 10, 5 and 1, and numbered by 10. Inside the degree scale the 32 points of the compass are marked, with the fleur-de-lis of north at 0?. Inside the degree circle and fixed with decoratively shaped supports is the geometrical square. The supporting strut at north is signed 'H.Cole.1586.'. Each side of the geometrical square is identified as 'Quadratum Geometricum' and carries a scale 60 to 0 to 60, divided to 15, 5 and 1, and numbered by 5. An alternative numbering on the same scale runs 12 to 0 to 12, numbered by 3. The length of the alidade matches the diameter of the horizontal circle. On one of its fiducial edges is a scale from 0 to 25, divided to 5 and 1, and numbered by 5. This was probably used in conjunction with the geometrical square, though it no longer has a perfect alignment. Rather than the alidade indicating a value on the scale of the geometrical square, the edge of the geometrical square indicated a value on the alidade's scale. This provided, in effect, an alternative (though more approximate) scale for the geometrical square. It is numbered in the opposite direction from the numbering on the geometrical square, giving its maximum value when the square reads 0, and vice versa. The alidade also carries two dovetailed projections on which sights can be fitted. A single sight survives; 128 mm in height, it is open and threaded. Jutting out beyond the north and south points are supports for two fixed sights. Each of the projections on which the sights were to be fitted is numbered, perhaps engraved by a later hand. The fixed sights are numbered 1 and 3, and the moveable sights on the alidade are 2 and 4. The surviving sight is itself numbered 2. The upper section of the instrument is attached to the alidade by two wing-nut screws and rotates with it. The alidade is retained by a disc pierced by three holes. These receive corresponding pins projecting on the underside of the compass bowl. This ensures that, although housed within the support for the vertical semicircle, the compass bowl is fixed in a unique orientation and does not rotate with the alidade. Both the compass needle and glass are missing. The altitude semicircle is held between the two uprights of the support and it can be fixed in a given position using the screw at its centre. The semicircle has a diameter of 123 mm and carries on both sides a scale of degrees and a shadow square. The degrees run 90 to 0 to 90, divided to 30, 10 and 1, and numbered by 10, while the elements of the shadow square are identified as '[trigon] Vmbra [trigon] Recta [trigon]' and '[trigon] Vmbra [trigon] Versa [trigon]', each running from 0 to 12, divided to 3 and 1, and numbered by 3. The fiducial edge of one of the uprights has the same complementary scale from 0 to 25 as is engraved on the alidade; in this case it is simply divided and numbered by 5. The sights for vertical observations are fixed at the ends of a 231 mm bar on the diameter of the semicircle. As well as left and right brackets on the top of the vanes, the near sight has a pinhole, while the foresight has a central bead. On the diameter of the vertical semicircle is the signature '[trigon] H [trigon] Cole [trigon] 1586 [trigon]'. On the underside of the upright there is a plummet. In use, the post of a pole or tripod would have been inserted into the cylindrical sleeve on the underside of the instrument and held there by the screw. The instrument is owned by St John's College, Oxford but during its history it was disassembled and various parts were dispersed. The upper section was found in the college's library and the compass box in a cellar. The horizontal circle was acquired by the collector Dr C. F. C. Beeson and given back to the college. Despite this separation there is little doubt about the validity of the reassembly. Aside from the fact that all of the parts of the instrument do indeed fit together (no small achievement), there are also smaller signs to confirm the reconstruction. For example, a double nick on the edge of the alidade tallies with one on the vertical support, and shows which way round the vertical circle should be fixed on the alidade. 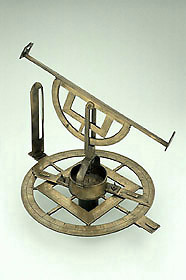 See R. T. Gunther, "The Great Astrolabe and other Scientific Instruments of Humphrey Cole", Archaeologia, 76 (1927), pp. 273-317, at pp. 301-2 and G. L'E. Turner, "Mathematical Instrument-Making in London in the 16th Century", in S. Tyacke (ed. ), English Map-Making 1500-1650 (London, 1983), pp. 93-106, at p. 102.